When the Nopili goby (Sicyopterus stimpsoni) moves from salt water to fresh water, over the course of two days, the fish’s mouth migrates from the tip of its head to its chin. This lets it adapt to its new environment. The scientists published their findings in the journal PLoS ONE¹. The adaptations allow it to scrape food from the rocks and climb up waterfalls. In order to get to the upper streams where they mate, the fish have to drag their bodies up the walls of wet rocks. The fish uses its suctioning mouth and a sucker on its stomach to inch its way upwards. High-speed video revealed that the fish feed quite differently than other gobies when they scrape diatoms from the rocks, as they extend their top jaw outwards and don’t pull the lower jaw back as much as other species. The movements were similar when the fish was eating and climbing. The scientists think that this is an example of exaptation, when a structure that was meant for one function is co-opted for another. For example, feathers might have originally been evolutionarily developed for insulation, but they also were pretty useful when it comes to flying. Scientists don’t know which function came first, the eating-by-scraping or the climbing-by-sucking. 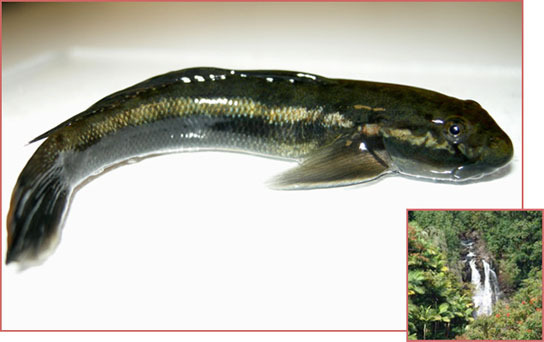 Be the first to comment on "Nopili Goby, The Waterfall Climbing Fish"